A short drive northeast from Austin, TX where city turns into country and horses coexist happily with humans, I turn into Eric Meyer’s driveway. Beyond the home is an unassuming metal building that houses the Noiz Faktory. I'm met by Eric just outside the entrance of the structure and as we are exchanging greetings it's evident that Eric is very excited about showing off what he's invested the last two years bringing to life. I had heard from others that it was something to see but as Eric opened the door I wasn't quite sure what to expect. I feel like I’m in an episode of Dr. Who and I've just walked into the Tardis. Just as with the aforementioned Dr. Who’s Tardis, the Noiz Faktory is bigger on the inside than you could imagine. Not just its physical presence but more importantly the ideas and ideals of the vision held by its creator. 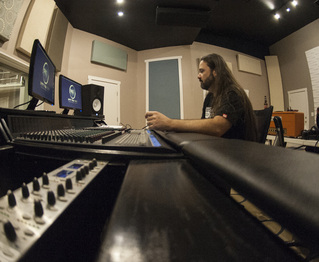 The Noiz Faktory is a multimedia multi-use recording and rehearsal studio with attention to the smallest details. Even more than that, the Noiz Faktory is an idea dedicated to fostering a creative community of musicians and providing a way to let the world hear what they have to say. enFocus: Who is Eric Meyer? EM: I'm a Texas transplant from Oregon that couldn't get here fast enough. By profession I am actually an MRI Technologist. I had spent enough years working in environments seeing more than my share of death and suffering that I made the decision that going forward, I wanted to focus my time and effort on doing some things that would be positive for music and musicians. enFocus: How is it that an MRI Technologist decides to build a recording studio? EM: Music has always been my passion and now was the time to do something about it. I hated working in healthcare and I grew up being fascinated by mixing consoles so that is where the idea of a studio came from. Along the way I learned to play guitar and piano and started giving lessons. As I would work with my students and from conversations with other musicians I begin to see certain problems that both were having getting their musical vision out to the world and so I decided to do something to start making a change one person at a time. enFocus: So from the pictures you shared with me, the Noiz Factory is truly a "from the ground up" venture. How did you go about getting this from an idea to what you now have in place? EM: The first person that got this project moving in a forward direction is my wife Angelica. While standing on the driveway of my old house my wife said that we need to buy some land so that we can build the studio correctly. I then brought up how expensive building a studio of this size would be. She didn't flinch and simply said tomorrow we need to go shopping for land so we can build our house and the studio on the same property. Angelica is nothing less than AMAZING to me. She has supported me and this dream without question. The sentence that I routinely say when it comes to my life and her willingness to support my dreams is “I'm the luckiest f***er on the planet”. This brings me to the next step which was to get the studio designed. enFocus: That was going to be my next question. People have dreams of things they'd like to do but so rarely do they ever get started even fewer see it to completion. Aside from the family support, how did you get this project underway? EM: The key player in the design and the construction of the studio is Dave Del Valle. Dave is an audio engineer, a musician, and an inventor. More importantly, Dave shares the values that I look for in the people that I hope to come through Noiz Faktory. He is an extremely kind person, a very hard worker and someone that I hold in extremely high regard. When Dave sat down with me to discuss the project, the only input I had initially was that I wanted to have the studio designed for easy load in and load out. I didn't want people to have to lug their gear through an alley with trash cans or through the lobby. The other item on my wish list was the ability to record live performances so that artists could have DVD's to sell. With the ability to video live performances and due to the size of the live room I thought we also could get a small audience in for the performance. The rest of the design I gave Dave complete free reign and asked him to design it the way he would want something built. As we progressed on the design of the building I had asked Dave if a 40'x80' building with 18' walls was big enough. Much to my surprise it was more than big enough and I was left with a residual 30'x40' area which meant I could incorporate another aspect of the studio...a store, music school, lounge, and silent rehearsal spaces. enFocus: You've stated that the vision you have for Noiz Factory is to help build into and grow a sense of community and support among musicians. How do you interact with the local community? EM: The music school idea is a great example of what I hope to accomplish and do for others. The idea came about from the years of working with a guitar student and friend Bailey Walker. As I worked with him and shopped gear with him I noticed that there were voids that were not being filled. First off it presented an opportunity to be a mentor to kids. I didn't have a mentor for music nor did I have people to teach me things or fiercely look out for me and help me buy the correct gear. In short, there's a 13 year old kid inside me that is pissed off because this was a component missing from his life. I decided to change things and lead by example. I'm also working with the local community colleges and the audio engineering students and once we are up and fully functional there will be audio engineering classes, guitar/bass/drum clinics, guitar and amp shows, etc. In the future we have plans to have guest quarters on site as we believe this will become a destination recording studio. In addition to that I plan on tying in to SXSW, Austin City Limits and other events as an off venue site for doing live performance videos in a story teller fashion so that the bands and the audience will be able to connect with one another. I want this place to be one where musicians can come together to learn, share, and support one another. enFocus: How about a global example? After Dave De Valle, the person that has had the greatest impact on Noiz Faktory is Acacio Carvalho. Acacio is a prog metal drummer from Brazil with a monster drum set. Frequently Acacio and I would discuss what he liked and didn't like about studios. Acacio is the reason I wanted to make the studio design easily accessible to the musicians. Acacio has a unique skill set in drumming, song writing, audio engineering, producing, graphic design, web design, and video production that I rarely see in musicians. Gallery of building Noiz Faktory from ground up.